Dear Readers: We hope you are safe and sound. I hope 2014 is a good year for you, your family and your friends. I hope the universe makes some of your dreams come true this year, and that you’re successful in overcoming some of your own challenges. And may your year be full of the things that bring you happiness in your life — whether it be family, good health, love, success, prosperity, a new job, relief from pain, or some combination of all of the above. We here at Blogger known wish you a very prosperous one in whatever you do. We would like to provides a memorable gift to our readers. I hope you will definitely like it and make comments on it. the name of this gift Maaz Blogger Template Its far every type of blogger like blogging, softwares, games, tips, news and others. Maaz blogger template is a gift, premium, responsive blog, magazine, multipurpose free blogger template adapted from WordPress with 3 columns in home page & static pages and 2 columns in post pages, responsive design, left and right sidebars, fresh look, minimalist, ads ready, pagination and neutral colors. 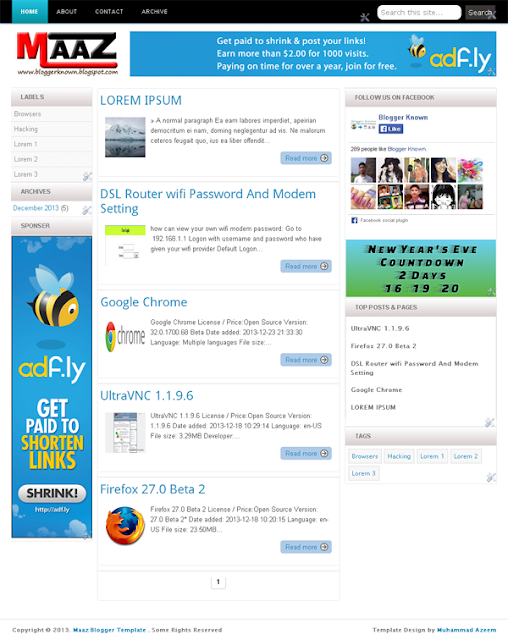 Excellent layout for blogs.This theme most used on softwares and games sites. Click the image below for DEMO! Like every year this year too will pass with some memories. But this year will be very important for me because i have a lot more work on this year, my education would be complete and I need to get more education to move forward. My English is undermines it will give special focus to improve. I'm getting married on this year I know this news will be crucial for all :P I've decided. Life's too short i hope you will all take decisions sensibly. How to Add Emoticons/Smileys in Blogger Comments?